There are survival kits, fishing kits, toiletry kits, and first aid kits. What I carry to the beach for my surf fishing trips is a mixture of all those. From the left, the first thing of interest is my SOG multi-tool. I have to be careful and make certain that I never lose it since they no longer make one as simple, compact and rugged. It has a small set of pliers, a strong wire cutter that will cut a treble hook, a couple of knife blades and two screw drivers and a file. The case to the left of it clips onto my pocket. Just above the knife is my Sea Tow membership card. While I do not need it when I am surf fishing, it stays in the phone case which I also use when I am boating with our skiff. If you get stuck out in the sound as I did once, they will want to see that after they haul you out. Just to the right and below is my Android-powered LG smart phone. It has a Sea Tow app which can lead the towboat right to me. I used it the one time that I got stuck. It also has Radar Now, a weather app, that lets me watch for storms and My Tracks, an Android app which creates maps from my hikes, kayak trips, and boat rides. I also use My Tracks when I am geotagging photos. Above the waterproof case which holds much of this including the smart phone is a tide table. Yes, there is an app for that but I like have a paper one just in case. The paper to the left of that is a copy of the most recent North Carolina fishing regulations. The little blue cloth is for cleaning my camera’s lens or my glasses. To the right of the tide table is a tube of sun screen for my lips. The small plastic bag is to protect my camera in a shower. Next is my wallet which has exactly $2.00 in cash which happens to be the cost of a bag of ice from one of the automated ice machines. Under the two dollars is one business card and one band-aid. The small clip style wallet is in a waterproof case. Above that is my fishing license, an old driver’s license, and a plastic box with two aspirins. Just to the right and below the box of aspirins is a spare SD card for my camera. The Sog multi-tool and the wallet are the only two things which do not go in the waterproof case for my cell phone. The case hangs around my neck and has a small trimmer for clipping the ends off fishing lines. There is also a clip there which I use for other spare tools that I might need like a tape measure. When I am in my kayak, a small line tied to my net and another tied to paddle are secured with that clip. When I am in our skiff, the kill switch hooks to that clip. Beyond this gear, my Canon SX50 HS is usually around my neck and my car keys are safely in the water proof case with my wallet. I also have some clip-on sunglasses that work well. Below you will see my hat and the small tackle box that also clips onto a clip attached to my belt. Once attached it fits nicely in one of the pockets of my shorts. The tackle box usually has a few of my favorite lures and a small pack of plastic gulps (not shown). I often carry a small microfiber hand cloth in my back pocket. That is touch of lime green at the top right of the photo. By the time I get out of the water and off the beach, it is usually wet. I often use it clean the sand off of my feet when I reach the boardwalk at the beach access. 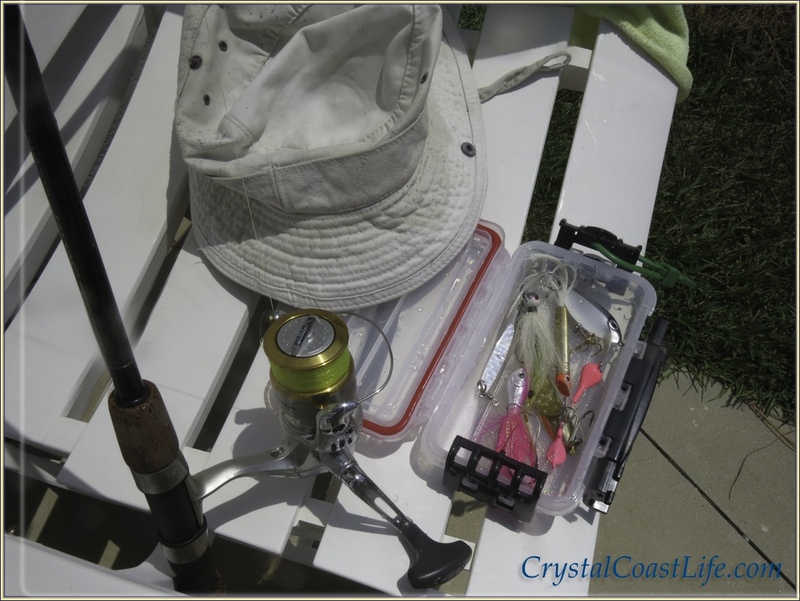 Some these items like the small tackle box transfer naturally to the waterproof yellow Calcutta bag that rides between my legs when kayaking or beside my seat when I am out in our skiff. My foot wear on the beach is a pair of crocs that I leave on shore when I am wading in the water. It takes a while to sort out your gear and travel as lightly as possible. This gear keeps changing but is pretty stable now after almost seven years of wandering the surf here on the Crystal Coast. Fishing with a heavy DSLR around my neck would be very hard so my Nikon stays at home. My Sony pocket camera recently died but someday I hope to have a small Nikon waterproof camera to replace my Canon and make fishing a little easier but that will have to stay on the wish list for now.